It’s been almost a month since I spent over a week in Paul Seller’s Foundations Class. More then enough time to reflect upon the lessons learned and the impact of the class on both my woodworking and general well being. After completing a desk for my daughter over a year ago I began looking at my method of work and satisfaction and noticed something was lacking. The project turned out nicely and I am well satisfied with the outcome; however I did not feel that I was truly connected with the wood, my children only visited me when machinery was off and I felt that the results were disconnected from the method. 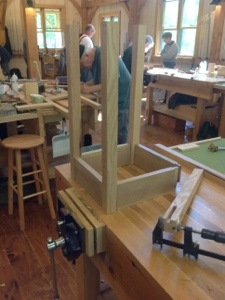 I turned to Shannon Rogers Hand Tool School and began his on line courses (they are excellent). After several projects and 6 months my hand skills were progressing nicely. If you have doubts that woodworking can be taught over the internet fear not. It is possible. I then built Chris Schwarz’s Tool Chest and my skills increased even more. My children now spent time with me in the garage trying planes and talking about their day. The wood grains and patterns danced before my eyes and I felt comfortable with my hobby. (and yes I still use the power tools when it makes sense). This past winter I began looking for new ways to increase my skills and stumbled upon Paul Seller’s videos and masterclass. I immediately signed up for the masterclass series and felt a rush of adrenaline as I began projects with the help of Paul Seller’s videos. These projects are shown on this blog. After a couple of projects I began contemplating the Foundations class. Questions began dancing through my head; How good are my skills? Will I be able to keep up in a class, 9 days? After more than a little angst I signed up…and wow what a great world I have let myself into! 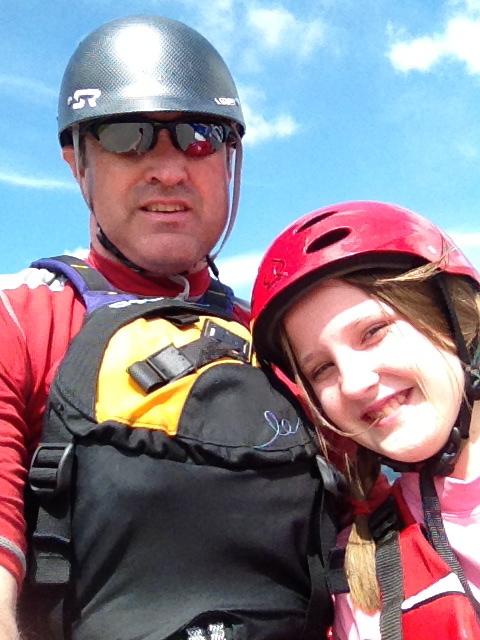 Paul’s teaching style is patient, exciting and an extraordinary gift. People with no prior experience to serious power tool users all watched in fascination as we learned and laughed. The projects were carefully planned to maximize the skills learned. No one was left behind or held back as all of our skills were catered to and enhanced. Paul is a gift to the woodworking community. There were 18 other students in the classroom (as a I type my friend Greg from the class sent me an email). They all were a large part of the experience. We all work in a craft that at times can be very solitary, it is probably in our nature. 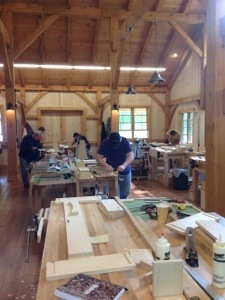 The chance to spend 9 days with people sharing a passion for woodworking, watching, learning and listening was moving. Yes I have been to shows and stood in the local store, but these guys were special. Greg, Steve, John, Eric and everyone else chisel on! In this post I struggle to put words on the screen that truly describe what I learned. 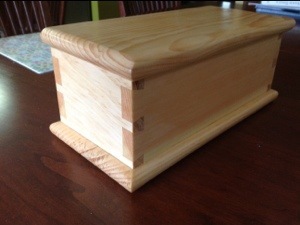 I learned a tremendous amount about hand tools, I learned joinery, I learned finishing. I watched a true master teach his craft with passion. I felt a sense of calm and well being that is rare. Go to the class and you will understand and if you can’t sign up for Paul Seller’s Master classes. The question that a few of you will ask .. so where does this stand against the week long kayaking trip? I continue to be a Masterclass member and my next project starting today is a coffee table. I am confident that the project will challenge my skills, provide me with numerous lessons, and keep the stars aligned. For my woodworking friends I’ll be there when you meed help with the clamps and in another class for another week. And for that other group of friends, I’ll meet you in the eddy, behind the boulder, river right. Working in an unheated garage over the winter has created quite a backlog of projects to finish. This weekend was cool and a little rainy but I took the opportunity to put a finish on three of the projects that are cluttering my bench. Like many of you finishing is not my favorite thing to do, being totally honest I sleep on a bed that has been completed for 15 years and still hasn’t finish on it. My goal was to finish the weather station, dovetailed box and shelves. This still leaves two other projects, but it certainly clears off my bench for new projects. 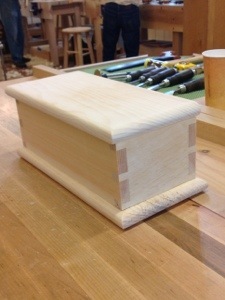 I tackled the dovetailed box first. This was one of the projects that I made in the foundations class with Paul Sellers. After sanding lightly I used clear shellac to coat the piece. Three coats put on a nice finish. Then I attacked it with a little steel wool to knock off any nibs, then I used the same wool to cut in some paste wax. Finishing with a soft cloth raised a nice shine. I repeated the process with the weather station that I built over the winter using the clock project on Paul Seller’s Masterclass. 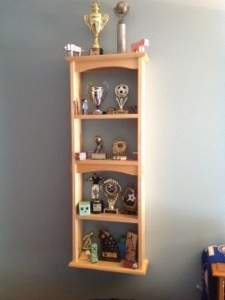 I then tackled the shelves that I made in the foundations class. 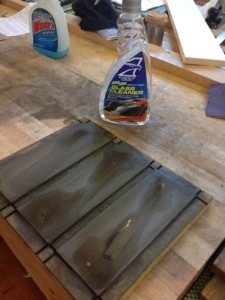 Same process again with the shellac and steel wool. This piece was claimed as soon as I got home for my sons’s soccer trophies. Next how to finish that oak side table? 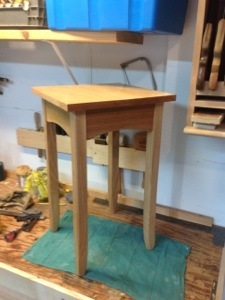 Today we begin work on the end table. Looking at the example near my bench it is clear that Paul has carefully thought through the lesson plans and has provided us with the skills needed to advance to this new project. 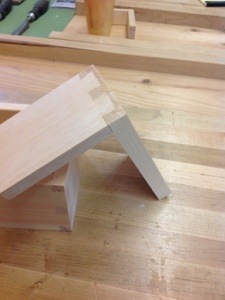 The one joint that we will now practice in earnest is the mortise and Tenon and we have an aid to help us with the task. The small jig in the picture is a guide, when placed in a vise adjacent to the mortise being cut it helps guide the chisel at a ninety degree angle and insure that the outside wall is straight. After carefully looking at the wood grain and choosing the best faces we proceeded to lay out mortises on all four legs. 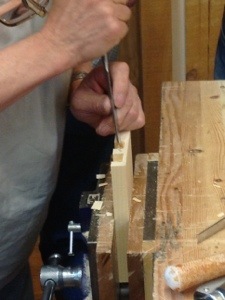 I had a lot of trouble with the mortise gage we had, but eventually completed the task and began chopping mortises. This provided plenty of practice and once I hit a rhythm I completed all eight in a short period of time. Only one minor problem which was easily fixed with a clamp and glue as the wood split. These were then extended into haunched mortises and tenons cut into the aprons to fit. Paul Sellers took a little time at this point to demonstrate saw sharpening and fortunately he sharpened the saw I was using with a progressive pitch. Saw sharpening has always been a mystery but with very clear instruction I now feel confident to do the job myself. The sharpened saw was amazing and the subtle change made a large difference in ease of starting a cut. The method can be found on You Tube under Paul Sellers saw sharpening. Take a moment to look around and enjoy Your environment. Now, look at the picture to the left and some of the others I have written about this week. Certainly your woodworking skills would benefit from being in a class room such as the one I have spent the last five days. The timber framing is beautiful, the light from the windows illuminates the bench and the sounds of saws and hammers are very peaceful. 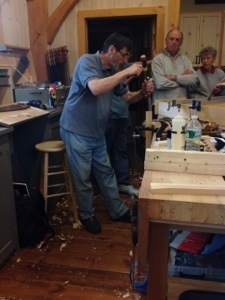 There are other classes held at the Maplewood Center for Common Craft in Greenwich, NY. One of them is timber framing and from the work in this building they know what they are doing. Reading through their website and brochure I also see other woodworking classes, raising sheep and several other interesting classes. As or more importantly everyone is extremely friendly, and people often stop in to speak briefly with Paul and watch the class. Day 4 and 5 work on the skills necessary to build book cases. The project that we have been working on and completed today includes stopped and stepped dados along with through mortises. We continued to refine skills learned on previous days and you can look around the shop and see some who had been timid previously, plane and chisel with confidence. Questions about sharpening faded and people work and sharpened without prodding. 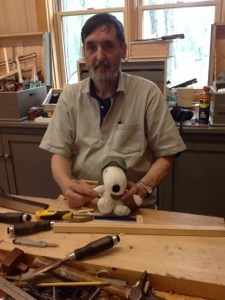 As always Paul spent a lot of time demonstrating at his bench, answering questions and helping. When he had a few moments to spare he carved a wooden spoon and I enjoyed watching. 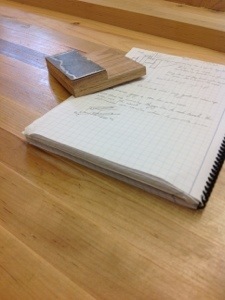 If you ever get the chance to come to one of Paul’s classes choose a bench next to his, there is much to learn. Learning is not only taking place from Paul, but your fellow students and each mistake is a chance to gain new knowledge. 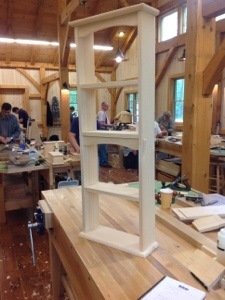 Although the shelf appears to be a simple project, and by the end of the first day I had completed the structure, there were many more lessons to learn. 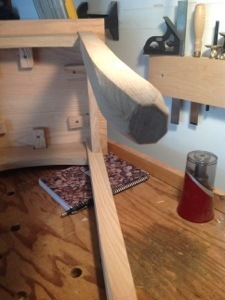 Adding curved cross rails that are mortised to the sides and a through mortise and tenon made this part of the shelf challenging and I had to slow down considerably. With some careful measurement and only a little minor blow out I completed the rails. Then came the decorative portion of the project. 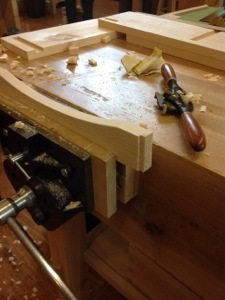 The through mortises are carefully rounded over using a Stanley #4 plane. Then the ends are pared with a chisel and finally smoothed with a file. The rails are embellished with a curve that is made using a chisel and spoke shave. 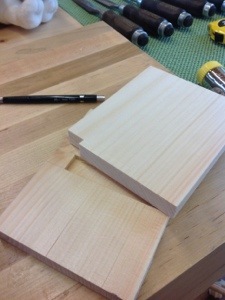 The result is much better than anything I have done on a bandsaw and quicker and more pleasant to accomplish. Again I am reminded of how quickly many of these tasks can be accomplished by hand! 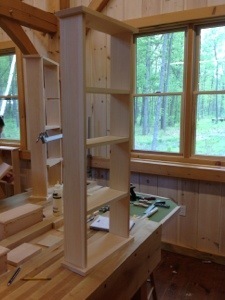 More detail is added to the top and bottom of the shelves and then we prepare for glue-up. Looking at the piece as it is clamped together I realize that the use of the hand plane to prepare each piece has left me with little sanding. I literally use a quarter of a piece of sandpaper to rough up the sides. Once glue up is completed I have a chance to look around the class and help others. I am amazed at the quality of work and the learning that has occurred. Coming into the class I had some experience but others had none and what the have accomplished is amazing. Everyone is more comfortable with each other and although we are enjoying the woodworking we are also enjoying each others company. Lunch is taken outside at a picnic table and everyone joins in sharing what they have and enjoying the day. It’s clean and crisp this morning close to 32 degrees. 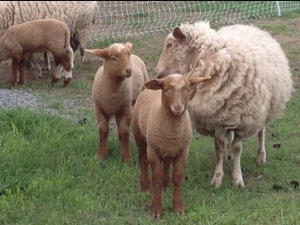 I took a quick photograph of the lambs this morning before class began. 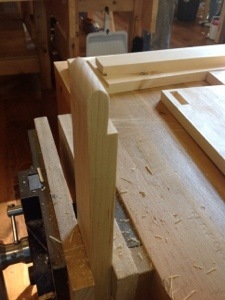 Todays’s focus was on hand cut dado joints as we worked to build shelves. All of the projects chosen step students through skill development and offer challenges at each step. Paul as always drew us around his bench several times over the day to demonstrate and reinforce techniques. Practicing through dados, blind dados, and stepped dados, we learned and practiced our new techniques. As the class struggled we learned and Paul and his assistant Logan pushed and pulled us through differing techniques. One would think that the learning would be confined to what was in front of us, but the lessons continued around methods of work, differing wood types, repairs to the parts we damage. We also talked about stepping outside our comfort zones and this is always where real learning takes place. Paul has a great sense of humor and is a natural teacher. 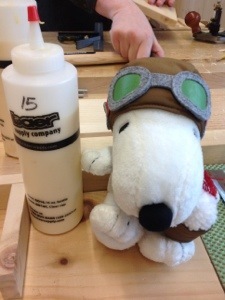 He was even able to provide Snoopy with some techniques for repairing his Sopwith Camel. Sharpening is a one of the critical skills of woodworking and the number of jigs and gizmos on the market are incredible. If you have a system that works use it and use it more frequently then you believe necessary. I have used water stones successfully for a long time. 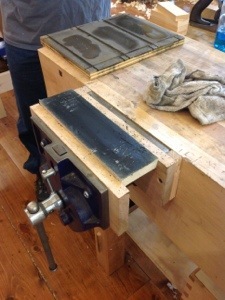 If you need a sharpening system Paul’s works extremely well, is simple and cost effective. At the end of the day I had sides, shelves, top and bottom, all hand made and looking pretty good except for that one piece! 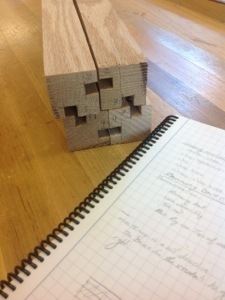 Tomorrow we work on mortise and Tennons. Day two arrived with a chill in the air, but the sun came out and the many flowers and leaves looked brilliant on the hill sides. I arrived at the class a little area and wandered up the road to peak at the sheep and new lambs. It’s a joy to watch them leaping and running in the grass. People were more talkative today as we gained knowledge of each other, we watched each other work, sought help and freely spoke. Tensions began to lift as everyone focused on their tasks. There was laughter and story telling as we worked. 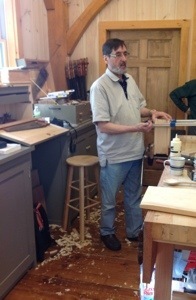 Paul began the day by demonstrating glue up of the box. One thing to note is his extensive use of his vise for everything. I’ll talk more later but the vise was his third hand for holding parts while spreading glue, and clamping the piece together. Paul has been building boxes along with us so that he is demonstrating as we go. Next he showed how to chisel the nubs (pins) that protruded and plane all of the edges and faces leaving a very smooth finish. The pictures below are of the edge planing which is done without removing the heal of the plane from one side to the next and the planing of the sides which was done in the vise with a board raising the center. 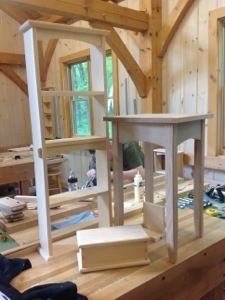 My fellow classmates range in age and experience and it is fun watching people complete their first dovetails and improve on their previous experiences. It was also fascinating watching Paul and his very talented assistant Logan demonstrate how to repair mistakes, many which became very difficult to spot. I bet on most of the museum pieces in the world there are many patches that go unnoticed. 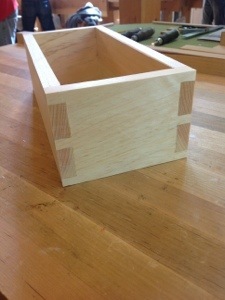 The dovetailed “shells” were set aside while the glue dried to prepare the top and bottom of the box. I missed photographing the the top and bottom of the boxes, but all of the edge rounding was done with a Stanley #4 and a tiny piece of sand paper. 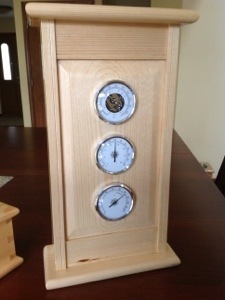 You can look at my weather station blog if you want a few more pictures. I’m finding less and less use for my router. 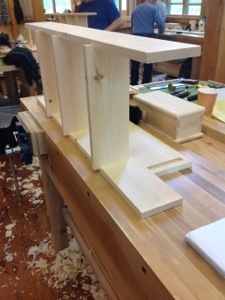 Paul misses few opportunities to pass on knowledge and when a couple of us finished ahead of the group he called us up to the bench and demonstrated how to make blind dovetails. Hs explanation was clear and concise and the results excellent. He works and teaches with such passion that you sit in awe until he cracks a friendly joke and banters back and forth with the students. This is how woodworking should be taught from someone that has worked the trade, has the passion to teach and the knowledge to throw in all of the extra tidbits that the books and videos miss. I’m noticing that Paul is very humble in his work, this may be contrary to some. His confidence and experience could be mistaken for slight arrogance, but sitting and talking with him reveals his true nature. There is so much more to tell and I have a notebook full of lessons and thoughts, but I think to fully appreciate what is happening in this class you must be here. One thing I discovered not through Paul but through other participants is the books and videos that Paul has written. The book which I saw on a bench is amazingly detailed and well written, if you can’t make the class this and perhaps the videos would have to suffice. By the way these were not mentioned or harped on by Paul making a sales pitch in any way, rather by others in the class. I’m looking forward to tomorrow and all that it will bring.